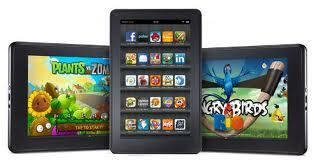 Tonight I present a wild and wacky program on the Kindle Fire at the Mountain View Library. Come join in the fun and hilarity! We’ll cover basic settings and functions- it’s a general program intended for adults, not the usual Little eLit fare. Party starts at 7 pm. See event info here and the flyer for the program here. We’ll also post step-by-step instructions and other resources. Posted on March 7, 2012, in eReader. Bookmark the permalink. Leave a comment.